Training as a Financial Coach – what’s it like? It’s all well and good for me to tell you what my Financial Coaching Training course is like from my point of view, but the best person to give you a real insight is someone that has done it. I asked one of my trainees (who has just begun practicing as a Financial Coach) to tell her story. Also, check out some photos from past training courses and have a read through our FAQs. What made you want to become a Financial Coach? I wanted to help others with their financial journey. Training opportunities were limited but through my research I found Simonne’s website and did a bit of reading around her philosophy and her work. The turning point for me was when I listened to her podcast and I felt like I was listening to a kindred spirit and it was then that I decided to train with Wise Monkey Financial Coaching. How did you feel when you arrived? I was nervous when I turned up on that first day, I wasn’t really sure what to expect! Would it be all chalk and talk? Would I be able to keep up? Well, I needn’t have worried at all! Simonne was so warm and welcoming that all my fears and nerves just disappeared. What was involved in the training days? We covered so much in the few days. I learned a lot about different coaching techniques and how to incorporate these in different client scenarios. I learned about the different types of financial advice and how to ensure that I was falling within the guidelines. This was really surprising in a lot of scenarios and I feel a lot more confident going forward with what I can and cannot advise on. It was incredibly important to understand, in particular, the boundaries of generic financial advice. We undertook role plays and coaching simulations in both the role of the coach and the client. This was so valuable as I was able to see just how Simonne would approach the client and demonstrate her techniques, as well as thinking about how I might approach a client and their situation. We also looked at genuine case studies, this was really useful because I felt like I was testing myself with the real-life scenarios that I may come across plus having the safety of the training to ask questions and revisit actions. There were many other interactive and experiential learning activities and discussions. I left the training feeling incredibly inspired and motivated! Not only did I get fantastic training, which was student-led as much as possible with lots of opportunity to work on particular elements I needed more practice or guidance with, but also an amazing pack of resources I was able to go away with. In addition to the fantastic binder which I added all my notes to, plus all the training materials, there is an electronic folder that is shared. This has everything required to work with clients and gets updated when Simonne has new material to share or something is amended. I felt like I came away with everything I needed to be able to start coaching clients of my own. I have already had the opportunity to start building up my own business as a Financial Coach and thank my training with Simonne for giving me the tools, knowledge and confidence to get out there and begin. 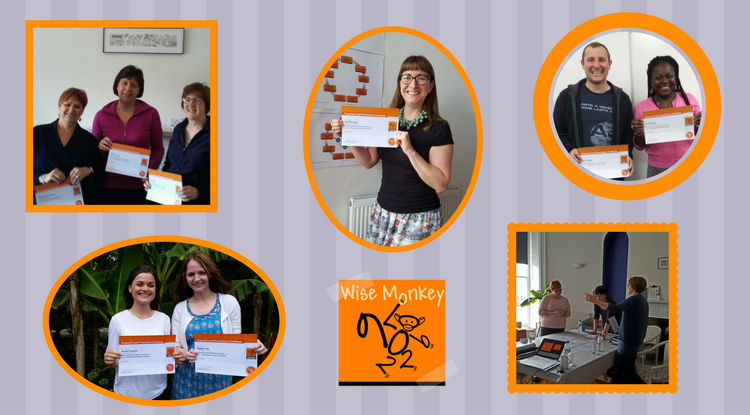 I can wholeheartedly recommend the course and would do it again in a heartbeat, I learned so much looking at the Wise Monkey Financial Coaching model. Not only did I learn just about money and coaching, but I learned about myself, my money story and about my own relationship with money. Although I knew my own journey and how I had come to be where I am, I was really surprised by what we uncovered through some of the coaching activities. For example, one of the activities involved looking at what money would look like if it came to tea. It led me to understand more about myself and my own relationship with money. Simonne is just so incredibly knowledgeable and passionate about her work and that shone through every minute of the training. She shared a wide range of skills, techniques, resources throughout as well as her own stories. The training was overflowing with content and materials and I loved that it covered a real mix of teaching methods. If this story has inspired you to consider training as a Financial Coach, full details of my next 5 day intensive course are here. Or click here for some commonly asked Q&As. Alternatively, if you would like to chat please give me a call on 01273 691223 or email me: simonne@financial-coaching.co.uk.